The described t test for assessing the difference of two mean values is a special case of an analysis of a qualitative (categorical) independent variable. A qualitative variable is defined by discrete levels, e.g., "stimulus off" vs. "stimulus on". If a design contains more than two levels assigned to a single or multiple factors, an analysis of variance (ANOVA) can be performed, which can be considered as an extension of the t test. The described correlation coefficient on the other hand is suited for the analysis of quantitative independent variables. A quantitative variable may be defined by any gradual time course. If more than one reference time course has to be considered, multiple regression analysis can be performed, which can be considered as an extension of the simple linear correlation analysis. The General Linear Model (GLM) is mathematically identical to a multiple regression analysis but stresses its suitability for both multiple qualitative and multiple quantitative variables. The GLM is suited to implement any parametric statistical test with one dependent variable, including any factorial ANOVA design as well as designs with a mixture of qualitative and quantitative variables (covariance analysis, ANCOVA). Because of its flexibility to incorporate multiple quantitative and qualitative independent variables, the GLM has become the core tool for fMRI data analysis after its introduction into the neuroimaging community by Friston and colleagues (Friston et al. 1994, 1995). The following sections briefly describe the mathematical background of the GLM in the context of fMRI data analysis; a comprehensive treatment of the GLM can be found in the standard statistical literature, e.g. Draper and Smith (1998) and Kutner et al. (2005). Note: In the fMRI literature, the term "General Linear Model" refers to its univariate version. The term "univariate" does in this context not refer to the number of independent variables, but to the number of dependent variables. As mentioned earlier, a separate statistical analysis is performed for each voxel time series (dependent variable). In its general form, the General Linear Model has been defined for multiple dependent variables, i.e. it encompasses tests as general as multivariate covariance analysis (MANCOVA). The y variable on the left side corresponds to the data, i.e. the measured time course of a single voxel. Time runs from top to bottom, i.e. y1 is the measured value at time point 1, y2 the measured value at time point 2 and so on. The voxel time course (left column) is "explained" by the terms on the right side of the equation. The first column on the right side corresponds to the first beta weight b0. The corresponding predictor time course X0 has a value of 1 for each time point and is, thus, also called "constant". Since multiplication with 1 does not alter the value of b0, this predictor time course (X0) does not explicitly appear in the equation. After estimation (see below), the value of b0 typically represents the signal level of the baseline condition and is also called intercept. While its absolute value is not informative, it is important to include the constant predictor in a design matrix since it allows the other predictors to model small condition-related fluctuations as increases or decreases relative to the baseline signal level. The other predictors on the right side model the expected time courses of different conditions. For multi-factorial designs, predictors may be defined coding combinations of condition levels in order to estimate main and interaction effects. The beta weight of a condition predictor quantifies the contribution of its time course in explaining the voxel time course. While the exact interpretation of beta values depends on the details of the design matrix, a large positive (negative) beta weight typically indicates that the voxel exhibits strong activation (deactivation) during the modeled experimental condition relative to baseline. All beta values together characterize a voxels "preference" for one or more experimental conditions. The last column in the system of equations contains error values, also called residuals, prediction errors or noise. These error values quantify the deviation of the measured voxel time course from the predicted time course, the linear combination of predictors. In this notation, the matrix X represents the design matrix containing the predictor time courses as column vectors. The beta values now appear in a separate vector b. The term Xb indicates matrix-vector multiplication. The figure above shows a graphical representation of the GLM. Time courses of the signal, predictors and residuals have been arranged in column form with time running from top to bottom as in the system of equations. The term in brackets contains a matrix-matrix multiplication of the transposed, X', and non-transposed, X, design matrix. This term results in a square matrix with a number of rows and columns corresponding to the number of predictors. Each cell of the X'X matrix contains the scalar product of two predictor vectors. The scalar product is obtained by summing all products of corresponding entries of two vectors corresponding to the calculation of covariance. This X'X matrix, thus, corresponds to the predictor variance-covariance matrix. The variance-covariance matrix is inverted as denoted by the "-1" symbol. The resulting matrix (X'X)-1 plays an essential role not only for the calculation of beta values but also for testing the significance of contrasts (see below). The remaining term on the right side, X'y, evaluates to a vector containing as many elements as predictors. Each element of this vector is the scalar product (covariance) of a predictor time course with the observed voxel time course. The values of the multiple correlation coefficient vary between 0 (no variance explained) to 1 (all variance explained by the model). A coefficient of R = 0.7, for example, corresponds to an explained variance of 49% (0.7x0.7). An alternative way to calculate the multiple correlation coefficient consists in computing a standard correlation coefficient between the predicted values and the observed values: R = ryy. This equation offers another view on the meaning of the multiple correlation coefficient quantifying the interrelationship (correlation) of the combined set of predictor variables with the observed time course. Note that if the design matrix (model) does not contain all relevant predictors, condition-related increases or decreases in the voxel time course will be explained by the error values instead of the model. It is, therefore, important that the design matrix is constructed with all expected effects, which may also include reference functions not related to experimental conditions, for example, estimated motion parameters or drift predictors if not removed during preprocessing. In case that all expected effects are properly modeled, the residuals should reflect only noise fluctuations. If some effects are not (correctly) modeled, a plot of the residuals will show low frequency fluctuations instead of a stationary noisy time course. A visualization of the residuals is, thus, a good diagnostic to assess whether the design matrix has been defined properly. With the known degrees of freedom, an F test can be converted in an error probability value p. A high F value (low p value) indicates that one or more experimental conditions substantially modulate the data time course. The numerator of this equation contains the described scalar product of the contrast and beta vector. The denominator defines the standard error of c'b, i.e. the variability of the estimate due to noise fluctuations. The standard error depends on the variance of the residuals Var(e) as well as on the design matrix X but not on the data time course y. With the known degrees of freedom, a t value for a specific contrast can be converted in an error probability value p using the equation shown earlier. Note that the null hypotheses above were formulated as c'b = 0 implying a two-sided alternative hypothesis, i.e. Ha: c'b != 0. A two-sided test is used as default in BrainVoyager QX. For one-sided alternative hypotheses, e.g., Ha: b1 > b2, the obtained p value from a two-sided test can be simply divided by 2 to get the p value for the one-sided test. If this p value is smaller than 0.05 and if the t value is positive, the alternative hypothesis may be concluded. Multicollinearity exists when predictors of the design matrix are highly intercorrelated. To assess multicollinearity, pairwise correlations between predictors are not sufficient. A better way to detect multicollinearity is to regress each predictor variable on all the other predictor variable and examine the resulting R2 values. Perfect or total multicollinearity occurs when a predictor of the design matrix is a linear function of one or more other predictors, i.e. when predictors are linearly dependent on each other. While in this case solutions for the GLM system of equations still exist, there is no unique solution for the beta values. From a mathematical perspective of the GLM, the square matrix X'X becomes singular, i.e. it looses (at least) one dimension, and is no longer invertible in case that X exhibits perfect multicollinearity. Matrix inversion is required to calculate the essential term (X'X)-1 used for computing beta values and standard error values (see above). Fortunately, special methods, including singular value decomposition (SVD), allow obtaining (pseudo-) inverses for singular (rank deficient) matrices. Note, however, that in this case the absolute values of beta weights are not interpretable and statistical hypothesis tests must meet special restrictions. 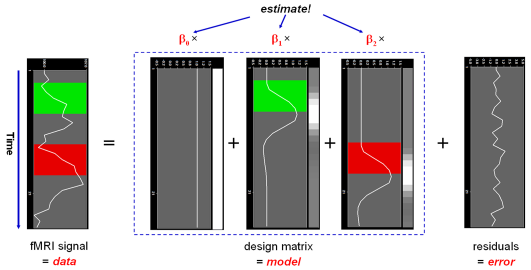 In fMRI design matrices, multicollinearity occurs if all conditions are modeled as predictors in the design matrix including the baseline (rest, control) condition. Without the baseline condition, multicollinearity is avoided and beta weights are obtained which are easily interpretable. As an example consider the case of two main conditions and a rest condition. 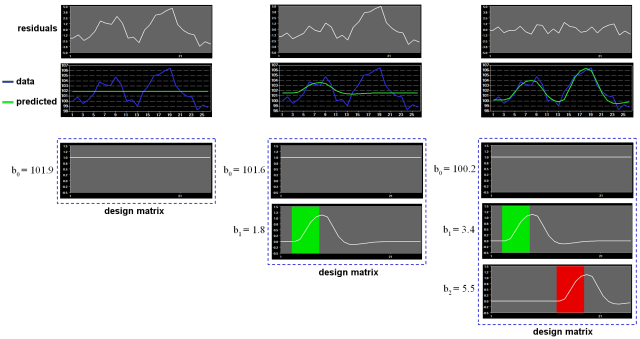 If we would not include the rest condition (recommended), the design matrix would not be multicollinear and the two beta weights b1 and b2 would be interpretable as increase or decrease of activity relative to the baseline signal level modeled by the constant term (see figure above, right column). This approach is recommended in BrainVoyager and is especially important when running GLMs for random-effects group analyses. Contrasts could be specified to test single beta weights, e.g. the contrast c = [1 0] would test whether condition 1 leads to significant (de)activation relative to baseline. Furthermore, the two main conditions could be compared with the contrast c =[-1 1], which would test whether condition 2 leads to significantly more activation than condition 1. If we would create the design matrix including a predictor for the rest condition, we would obtain perfect multicollinearity and the matrix X'X would be singular. Using a pseudo-inverse or SVD approach, we would obtain now three beta values (plus the constant), one for the rest condition, one for main condition 1 and one for main condition 2. While the values of beta weights might not be interpretable, correct inferences of contrasts can be obtained if an additional restriction is met, typically that the sum of the contrast coefficients equals 0. To test whether main condition 1 differs significantly from the rest condition, the contrast c = [-1 +1 0] would now be used. The contrast c = [0 -1 +1] would be used to test whether condition 2 leads to more activation than condition 1. Given a correct model, the estimation routine (ordinary least squares, OLS) of the GLM operates correctly only under the following assumptions. The population error values ε must have an expected value of zero at each time point, i.e. E[εi] = 0, and constant variance, i.e. Var[εi] = σ2. Furthermore, the error values are assumed to be uncorrelated, i.e. Cov(εi,εj) = 0 for all i != j. To justify the use of t and F distributions in hypothesis tests, errors are further assumed to be normally distributed, i.e. ei ~ N(0, σ2). In summary, errors are assumed to be normal independent and identically distributed (abbreviated as "normal i.i.d."). Under these conditions, the solution obtained by the least squares method is optimal in the sense that it provides the most efficient unbiased estimation of the beta values. While robust to small violations, assumptions should be checked using sample data. For fMRI measurements, the assumption of uncorrelated error values requires special attention. The superscript "n" indicates the values of the new, adjusted time course. The same calculation is also applied to each predictor time course resulting in an adjusted design matrix Xn. In the third step, the GLM is recomputed using the corrected voxel time course and corrected design matrix resulting finally in correct standard errors for beta estimates and to correct significance levels for contrasts. If autocorrelation is not sufficiently reduced in the new residuals, the procedure can be repeated. While the AR(1) method for removal of serial correlations works well, it has been recently shown that a second-order, AR(2), model outperforms the AR(1) as well as other approaches currently used in fMRI data analysis. Since BrainVoyager QX 2.4, the AR(2) model is therefore used as the default approach to remove serial correlations from residual time courses in BrainVoyager QX; if desired, the simpler AR(1) model can still be specified. Note that the AR(2) model is turned on as default when calculating GLM analyses. Lenoski, B., Baxter, L. C., Karam, L. J., Maisog, J., and Debbins, J. (2008). On the performance of autocorrela- tion estimation algorithms for fMRI analysis. IEEE Journal of selected topics in signal processing, 2, 828–838.